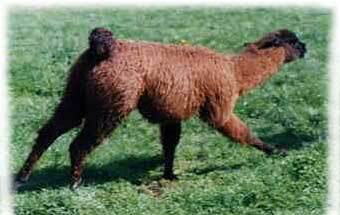 Don't CHASE, you will need to gain the trust of the llama, horse feed put in a catch pen will lure the llama to a place you can gain his trust. If time is not a factor, try this for several days and the llama will become familiar with you and the food. Do Not try to touch the head or face, this will scare the llama. This is information from a presentation that was shared by Tom and Judy Ross, Good News Llamas, at the spring meeting of the Kentucky Animal Care and Control Managers, Louisville, KY. Many people helped provide information contained in the talk that was given to 70 attendees. 100 packets were handed out that contained the following information to be used as a guideline in the capture and housing of a "runaway" llama. Demonstrations were given on use of herding polls, catch rope, herding tape and different ways to build a catch pen. You are welcome to print this information and give to agencies in your area that might benefit from the contents. Please contact us if you have any questions about the information. why the llama acts the way he does. Llamas In Peril - Why do we find "runaway llamas"?